Horrible. There will not be peace in this word till hunger ends. Hunger is immoral. we should send blackwater there. Terrible. Thank you for letting people know. Yes there is alot of hunger in the world.So sad.Notd. Thanks Marta. This really is sad. I guess to help, we should donate to Save the Children? Oh, my god! This thig should not be! There must'be a hungry child on this world! What to do? How can this be solved permanently? We in the developed countries throw enough food away daily to keep these children fed. We have to keep the food aid comming and increase it - everyone needs to help otherwise these children will never get better. I also get the feeling that we are fighting a losing battle unless these warring factions lay down their arms and help. It's so sad when there is enough food in the world for everyone. It seems that money is the root of all evil, for many, it's more important than a human life. 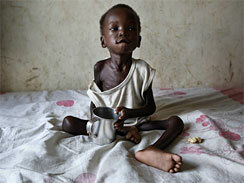 The gozillionaires need to look at these pics several times a day, have videos of real life starvation. Some how a difference has to be made, this is not acceptable when there is plenty for everyone. What a strange world . . . sad . . .